5" x 7.5" stitched on 14 count. 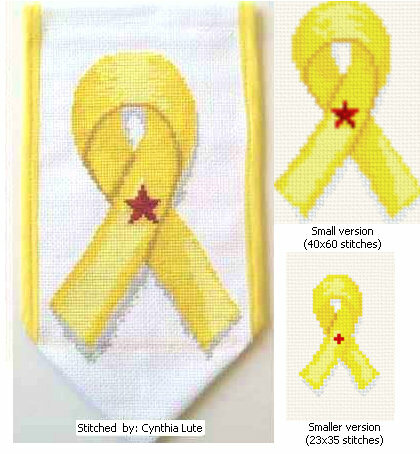 Free Yellow Ribbon cross stitch pattern... This design uses only full cross-stitches. Also includes 2 smaller designs. If you don't already have a PDF reader we recommend: Foxit Reader (smallest download) - or the original: Adobe Reader. Both are free downloads. - (Or, for the easiest fix, just switch to the free Google Chrome web browser.). - By distributing our designs on the Internet instead of publishing leaflets we can reach more people, and save you the extra costs of printing and shipping. You also never have to worry about damaged or lost pages. Just print out a new pattern any time!